Summary: Growing up in an affluent suburb of New York City, sixteen-year-old Nevaeh Levitz never thought much about her biracial roots. When her Black mom and Jewish dad split up, she relocates to her mom's family home in Harlem and is forced to confront her identity for the first time. Nevaeh wants to get to know her extended family, but one of her cousins can't stand that Nevaeh, who inadvertently passes as white, is too privileged, pampered, and selfish to relate to the injustices they face on a daily basis as African Americans. In the midst of attempting to blend their families, Nevaeh's dad decides that she should have a belated bat mitzvah instead of a sweet sixteen, which guarantees social humiliation at her posh private school. Even with the push and pull of her two cultures, Nevaeh does what she's always done when life gets complicated: she stays silent. It's only when Nevaeh stumbles upon a secret from her mom's past, finds herself falling in love, and sees firsthand the prejudice her family faces that she begins to realize she has a voice. And she has choices. Will she continue to let circumstances dictate her path? Or will she find power in herself and decide once and for all who and where she is meant to be? As soon as I saw this book come across my page on Goodreads, I knew that it was something I would be interested in. If you're a longtime follower of The Book Bratz, you already know that I'm a sucker for all things contemporary, which already drew me in, and then when I found out it was set in New York City I was even more intrigued, and then when I actually read the summary and figured out what this book was about and all of the hard-hitting topics it discussed...that's it. I knew this was a story that I was going to love. So I'm so glad that I was given the chance to review it! As the summary explains, Nevaeh's mother is black and Baptist, and her father is white and Jewish, so she was never quite sure where she fit in. On one hand, she felt out of place in her father's world, but on the other, her light skin ostracizes her from her peers in her mother's Harlem community. For Nevaeh, it feels like she's an outcast wherever she turns -- a puzzle piece that doesn't quite fit into any place. And then it gets ten times worse when her parents suddenly split, seemingly out of nowhere -- as if she needed another reason to feel like her life was turning upside down. So the book follows Nevaeh as she struggles to find her place in the world and in her community, coming to terms with a way to bridge both halves of herself in a way that finally makes her feel whole. I really loved reading this book. It discusses a lot of important topics, especially about religion, racism, family dynamics, and feeling out of place. Nevaeh isn't quite sure where she even feels like she belongs -- she just knows that she doesn't quite feel like she fits in on either side of her family. But it was really heartwarming and empowering to see that throughout the book, Nevaeh learns that she doesn't really have to "choose a side," so to speak -- she is multiracial, a blend of different cultures, and so she realizes that she can choose both. It was also really touching to read the ending letter of this book and to find out that Natasha Diaz herself also struggled wit ha lot of the things Nevaeh struggled with, as a multiracial woman herself -- and I was shocked to find out that a lot of events that happened in the book, particularly some of the more heartbreaking and horrific ones, happened in the author's own life as well. It really painted a vivid picture of the struggles of race, class, and prejudice that many people, including white-presenting multiracial individuals -- have to face, and also some of the privileges that they're also awarded without their consent. It's definitely a slippery slope, but Natasha Diaz's writing seems to navigate it with ease, creating a beautiful, heartwarming story for readers that really makes them sit down and think. My favorite character in this book was definitely Jesus. He was funny and kind and sweet, and always seemed to be there for Nevaeh whenever she was struggling. He was definitely great boyfriend material and I shipped them pretty heart. His family was really sweet and amazing, too! What I loved most about Jesus, though, is the way that he started to encourage Nevaeh to feel like she belonged in "his world", even when she wasn't quite sure that she did. Even though that's something that she eventually came to terms with on her own and didn't need the assistance of anyone else, especially a boyfriend, her meeting him was part of what set the thought process in motion, and it just added to all of the reasons that I already loved him. Another really interesting (and positive) thing about this book was the poems scattered throughout it. Throughout the story, Nevaeh starts to write poetry and find her voice to share it with the world, and there's definitely a sampling of it that we get to experience. I thought all of the poems were beautiful and really made you think -- and they really seemed to delight Nevaeh's audiences as well (although sometimes, I wasn't quite sure why their placement was assigned to a particular spot, because I felt like it jarred me out of the story a little bit). In a way, those poems reminded me a little bit of The Poet X, which was another excellent story that I really enjoyed! 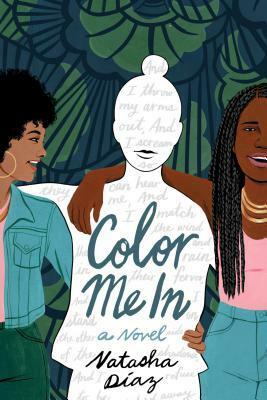 Overall, I really enjoyed reading Color Me In, and it's definitely a book that I recommend everyone puts on their TBR immediately. I read nearly 200 pages in a single sitting because I was addicted and just wanted to read the next chapter -- something that hasn't happened to me in quite a long time! This book sent me on an emotional rollercoaster that made me laugh, smile, cry, and gasp at all the right moments. If you're looking for some 2019 debuts to latch onto, I'd definitely recommend giving this one a try!